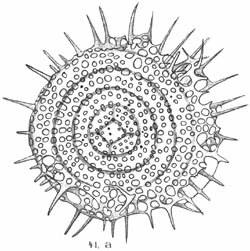 This species corresponds well in structure to the foregoing one [Stylodictya validispina], but differs in a marked degree with regard to its radial spines, which are particularly numerous, and are more irregularly placed, not all lying at the same level, that of the disc, but pointing obliquely beyond and beneath it. Shape of the shell in side view: Broadly linear, with rounded corners and ends. From the centre to near the margin, there are small scattered punctiform byspines. System of rings: On the whole like the preceding, only the rings are more irregular in shape and width. Outside the fourth ring there seems to be traceable the beginning of a 5th which is as yet not formed. Pores: On the whole like those of the preceding. Very large pores here and there on the edge of the disc, which would probably have formed several smaller ones later on. The byspines are very scattered, fewer in number than in the preceding species, but distributed over a larger part of the disc. Radial spines: The rings are united similarly to those in the preceding species, but the number of radial spines around the disc is larger, more than 30. The spines are narrower and more irregularly developed, some being a little bent, turned outwards and obliquely upwards, not all at the same level, equatorial, but distributed over the broad, rounded margin of the disc. The length of the spines is about the same as in the preceding species. Byspines: Very similar to those of the preceding species, but more scattered and distributed over the whole of the disc nearly out to the margin. Dimensions: The diameter of the inmost shell 12µm, of the first ring about 38µm, of the second 54µm, of the third 85µm, of the fourth 110µm. Pores uneven, most of them being 2-4µm. The spines protrude as much as to 30µm. The disc is 28µm in thickness. This form appears to differ considerably from the other species on account of the irregularly placed marginal spines. The specimen illustrated is probably not quite fully developed. Species very similar to foregoing [Stylodictya validispina]. Differentiated by greater irregularity of structure of shell, which has effect upon disposition of chambers, radial cross-pieces, needles, and pores. In addition, in S. aculeata width of chambers increases more markedly towards periphery of disk than in previous species. S. aculeata differs from S. validispina also in larger numbers of pores lying across width of one chamber (4-4.5). Dimensions: diameter of middle chamber 15-17µ, diameter of first ring 30-35µ, of second about 55µm, of third about 80µm, of fourth 110-120µ, diameter of disk with five rings about 150µ. Location: Found by Jørgensen (1905) in plankton off coast of Norway. In our Antarctic material located in sediment of stations lying south of 60°S lat., comparatively few and do not constitute fixed percentage of total number.